HOMEBUILT SHELLS fill the sky with brilliant bursts. An aquamarine laser shoots oscillating beams that shimmer against the distant sagebrush. The thunder of an afterburner pierces the air, and glowing tracer bullets arc across the machine-gun firing area. Pungent smoke billows. 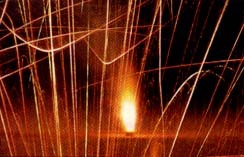 Welcome to Desert Blast, a secret annual gathering of pyrotechnics enthusiasts and a private fireworks party that in some ways resembles a July 4th picnic. Just delete the youngsters and the mayor's speech. Substitute a jet car, a gun collection, and a stark desert setting where death by dehydration is a genuine possibility. Broad-brimmed hats and water bottles are a good idea out here on the cracked beige expanse of a remote, dry lake bed in Nevada, a state with plenty of wide-open space to accommodate folks who are lusting for combustion. 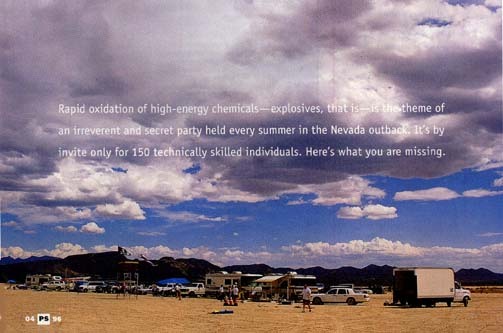 Each summer a group of about 150 thrill seekers converges here, by invitation only, to celebrate the joys of combining oxygen with explosive chemicals. 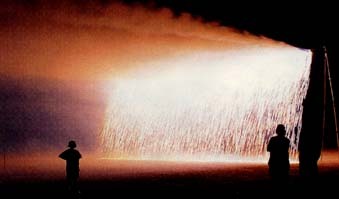 A gasoline bomb (top) explodes, tossing burning magnesium chips into the air. 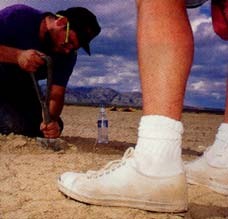 Desert Blast attendees (left to right) stave off dehydration and prepare pyrotechnic displays for nightfall. In workshops scattered around the Southwest, many hours have been spent preparing combustible devices and outrageous vehicles. A circle of people, most of them technical types by trade, lend their skills and labor to make the Blast happen. They're led by principal instigators Bob Lazar, who describes himself as a "freelance scientist and businessman," and real-estate appraiser Gene Huff. Lazar is an accomplished pyrotechnist who caught the bug at a tender age attending fireworks displays produced by the famous Grucci family. As a teenager living in California, he gravitated to El Mirage dry lake in the Mojave Desert, where motorcyclists went to drive fast and fireworks builders gathered to ignite their creations. He learned to construct shells that spit big bursts of color at impressive heights. After moving to Las Vegas, Lazar began periodically heading out into the desert with friends to fire off shells. Thus was born the Desert Blast tradition. "As the thing started to grow, we trained more people in assembling shells and rockets," he says. "We've got a particular color of blue and an electric magenta that you won't see anywhere else." Some Blast attendees jest that final fireworks assembly takes place at a secret facility many stories underground. The joke is a reference to Lazar's personal history: He is best known for going public in 1989 with an account of having worked on hovering, disc-shaped aircraft at a classified government facility near the mysterious Groom Lake air base. 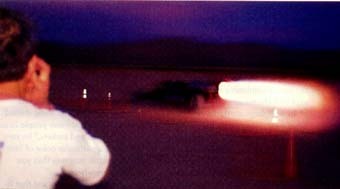 An important ingredient of a Desert Blast is the spectacle of Lazar's jet car shrieking across the lake, belching yellow-white flame from a hand-fabricated afterburner. Acquired as government surplus, its Westinghouse J34-36 turbojet engine originally powered a Navy Banshee fighter. A tubular steel frame, four wheels, and nothing extra make up this thrusting machine, said to have been clocked at more than 300 mph. Another fire-breathing propulsion system powers an insane pint-size vehicle: the ramjet go-cart. Once ignited, the propane-gobbling engine begins to glow cherry red, emitting an eerie sound that has been compared to a giant table being dragged across a linoleum floor. Although there's no ice anywhere nearby, Waldo Stakes has brought a vehicle with three runners that's designed to break the world's record for speed on a frozen lake. Stakes and rocket engineer Ken Mason have their creation lashed to a trailer for a crowd-pleasing test firing. Fueled by alcohol and liquid oxygen, the engine is similar to the design used in the Bell X-l airplane that first broke the sound barrier in 1947. Slender, pointy, and finned, the ice rocket raises a rooster tail of fire and dust as it strains against the steel cables. Mason has also brought a water-cooled argon laser with two movable mirrors. After sunset, the desert scrub bordering the lake bed begins to flicker brightly as a man plugged into loudspeakers plays The Star Spangled Banner , Jimi Hendrix-style, on his electric guitar. Above him on the Desert Blast command tower flaps a black flag bearing the skull-and-crossbones favored by pirates and outlaw biker gangs. 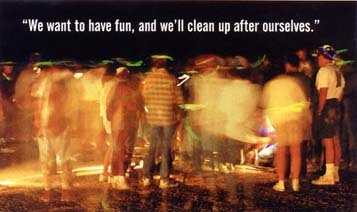 "We want to have fun, and we'll clean up after ourselves. So just leave us alone," says Lazar. "You can't burn down a lake bed." Some guests build scale-model cannons. The firing procedure: Beat a hasty retreat after lighting the fuse with a propane torch. Black powder sends the projectile on its way to. . .somewhere. Author jams fingers deep in his ears as jet car afterburner spews sternum-rattling tail of hellfire. Excavating a small crater for a gas bomb's M800 detonator ensures a Hollywood-caliber fireball that makes a satisfying thump. Great colors! Secret chemical recipes lovingly refined by pyrotechnists trace signature hues across the night sky. The Waterfall mesmerizes onlookers for five long minutes. A bicyclist wearing a fire-resistant suit made a few dramatic passes through the shower of sparks. Blast workers in action, festooned with luminescent headbands. Jolly Roger flying atop the command tower conveys the spirit of the event. Don't even think about bringing pets or kids under 18. No, you can't stay at Bob's house. You will be in the middle of the desert in the summer. If you don't bring food and water for yourself, you will die. There will be large fireworks, explosions, loud noises, unsafe conditions, and other dangerous things like random gunfire. If these things frighten you, you're at the wrong party. Do not bring any homemade fireworks. No, we don't trust your handiwork. Please shoot guns only in the designated area. Try not to kill anyone. If you are driving out to the dry lake, get there before 8:30 p.m. If you don't, the dirt road will be very hard to find. Clean up your mess when you leave and take it home with you. There are no bathrooms in the desert, only bushes. Your safety is your own problem. No one has been hurt in the past nine years, and it would be nice if we could keep it that way. If you get hurt, or if the paint gets burnt off your car, the only one responsible will be you.-S.F.B. HTML by Area 51 Research Center, March 15, 1996.